Assessments are done Monday through Friday from 8:00 A.M. to 2:30 P.M. on a walk-in basis. No appointments necessary. Or live on the WMAT reservation. Or in a relationship with a tribal member. Identification card with a visible picture on it. Tribal, State, and/or Affidavit copy with picture is accepted. Referral letter, if any, should be brought in at the time of assessment. (Something in writing about why you are being referred to RTC). Assessment will take between 1-3 hours. You will be asked questions regarding substance abuse, trauma, health issues, and/or other matters you are dealing with. Upon completion of assessment, the client will not start any program, or be referred to any, on that day. It will have to be staffed with the Recovery Support Specialist first. Assessments are no longer effective for 6 months, or a year. If a client is non-compliant in their programs for 3 months then another assessment will need to be completed. Once an assessment chart is put together the clinical support team will conduct a staffing which is done 1 to 3 times a week. At that time recommendations will be determined, for which programs the clients will be referred to. 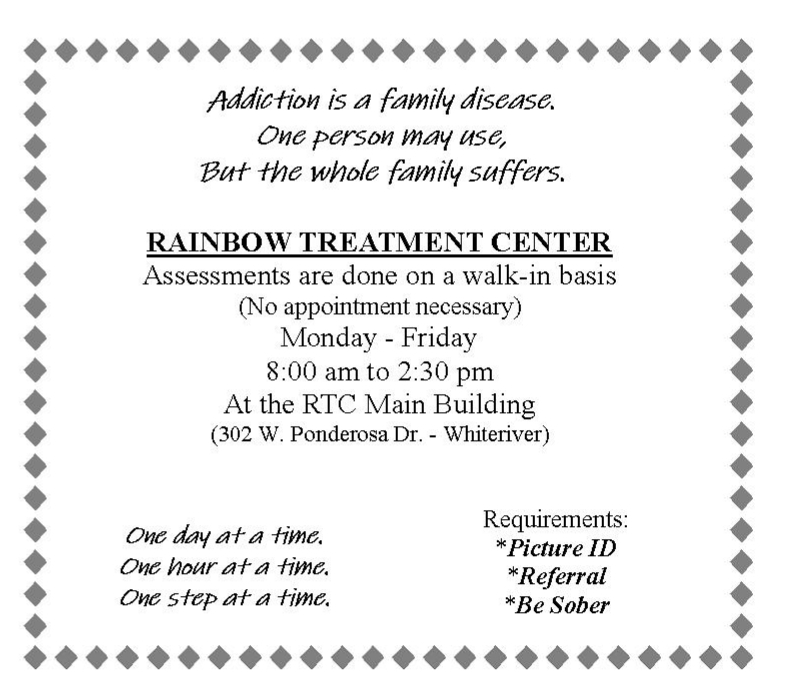 The Recovery Support Specialist will call, write, or conduct a home visit to inform the client of their decision. The Intake department no longer signs off on the two-way or three way memos. Any correspondents will be handled by the Recovery Support Staff.